Real estate remains the most stable investment for retirement income, thanks to a distressed housing market and the high rates of foreclosures it brings. As Jason Hartman’s investment guidelines recommend, rental property creates a steady income from tenant rents, with additional tax breaks for property owners. One way to acquire those promising properties quickly, and with minimal effort, is through auction sales. Real estate auction sales take place in communities throughout the United States and online, as individual sellers, mortgage companies and lenders place houses and other kinds of property up for bidding in hopes of a quick sale. Many, though not all, houses placed into public auction are foreclosures; homeowners themselves can initiate an auction sale to avoid many of the delays and complications of a typical real estate sale. While auction sales offer significant benefits for rental investors, it’s important to be aware of the very real disadvantages of purchasing real estate in this way. Real estate auctions, whether conducted in person or online through a variety of regional and national auction houses, may not require a real estate agent. Online auction houses allow buyers to create an account and handle all bids themselves, and local real estate auctions require only that buyers appear on the auction day and show that they have the funds to back the purchase. The most obvious plus to purchasing property at auction is price. In general, if a property has been placed into auction, it has most likely been on the market for a long period without a sale, so bidding at auction often starts at an extremely low reserve price – in may cases as low as a quarter of the appraised price. In auction sales there are no negotiations – the seller can either accept a bid or decline it, and ownership goes to the highest bid at the close of the auction. Closing on an auction property takes place very quickly, usually within 30 days of the end of the auction, and closing costs are generally minimal. Buyers in many states have a “grace period” after the close of auction to change their minds and back out of the purchase commitment. Since auction prices are very low, buyers can pay cash or work with a lender for a pre-approved loan, which either eliminates a mortgage entirely or keeps it very low. The low prices of auction properties make it possible to buy large houses, some multiplex properties and land for a fraction of the typical cost, but buyers need to be cautious. 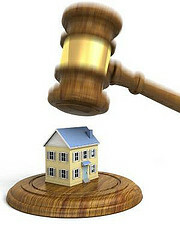 Auction properties are typically sold as-is, and buyers must accept this condition. Although in many cases purchasers can conduct property inspections before and during the auction period, these homes usually come without a warranty, with no recourse if problems are discovered later. Because of foreclosure and long vacancy, properties sold at auction are often “fixer-uppers,” and may have suffered vandalism. The expense needed to repair and maintain the property is an important factor when calculating the property’s return on your investment. New owners also inherit any tax liens on the property.